Eden Hazard has refused to rule out a ‘dream’ move to Real Madrid. The Belgian star came close to leaving for the Spanish giants last summer after a miserable season under Antonio Conte before a sparkling World Cup. Madrid pursued Hazard throughout the summer but balked at Chelsea’s £200million valuation of their prized asset. Hazard, 27, insists he is happy now Maurizio Sarri is in charge – but he offered no commitment to the West Londoners beyond the next year. 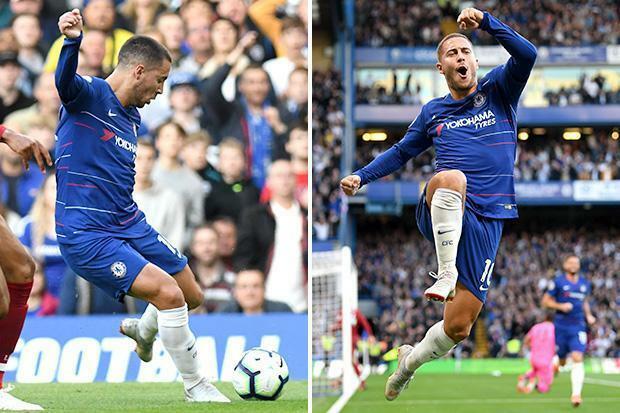 Hazard scored another stunning goal against Liverpool in their 1-1 draw at Stamford Bridge. And before the game, he told BT Sport: “I am happy here, the new manager came in and we enjoy playing with him. “To stay was the right decision. I have two years left on my contract – I can sign a new deal, maybe not, I don’t know. “I’ll tell you the truth, after the World Cup I wanted to leave. It’s my dream to play in Spain. Then I spoke to the board and the manager and I said “I can stay no problem”. Asked if he could finish his career at Chelsea, he added: “Yes, for sure. The fans love me. I like the club, I like the city, and I think my teammates love me also.